If you're looking for a fun thing to do, then you need to consider one of Texas' best natural attractions - . What makes this Texas attraction in the hill country fun is during your visit you can choose from a couple different tours of the caverns, enjoy a zip, or try the challenge course. 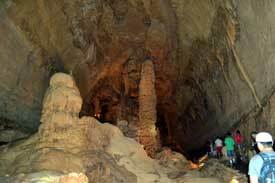 Natural Bridge Caverns was discovered in 1960 and the original passage extended for two miles to the north. In 1968, believing that the cave was most likely larger than what was already discovered, exploratory shafts were drilled south of the original cavern entrance and an additional half mile of cavern, called Hidden Passages, was discovered. Special conditions exist in Hidden Passages which allowed for the growth of extremely delicate and well formed formations with unusually long "soda straws," waves of "cave ribbon," towering stone monuments, and a profusion of intriguing "welt and turnip shields" plus stalagmites, flows, and stalagtites. The caverns are still very active and growing and water flows and drips constantly throughout, causing the formations to retain a waxy luster that can be seen in few caverns. The cavern is named after the natural 65 foot limestone slab bridge that spans the amphitheater setting of the cavern's entrance. 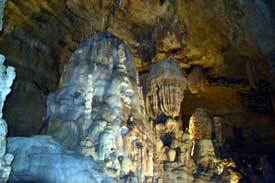 During our visit to this outstanding Texas attraction, we really enjoyed the 75 minute Discovery tour which took us deep into the cavern to immense chambers with extraordinary formations. The trail meanders through the caverns as it traverses down and then back up to the surface. On the Hidden Passages Tour there are over 180 steps, several landings that offer a rest as well as some stunning views of unique and unusual formations, and the cavern is dramatically lit which enhances this fun experience. Our guide was funny as well as very interesting and informative as he explained the formations, some history of the cave, and answered questions. We started the tour under the 60' natural limestone bridge that was formed by a large sinkhole and descended down a trail deep into the cavern - at the lowest point we were over 180' below the surface. Along the way we saw some unbelievable formations appropriately named Sherwood Forest, Castle of the White Giants, Purgatory Creek, the Watchtower, the Hall of the Mountain King (a chamber the size of a football field!) and other immense chambers that are very impressive! Lots of wows, ooh's, and aahs as we meandered through the formations. All too soon we were back to the surface! But ready to buy some souvenirs of your tour and enjoy some food at the snack bar. Adventure Tours - the adventure tours require advance reservations and last 3 to 4 hours. 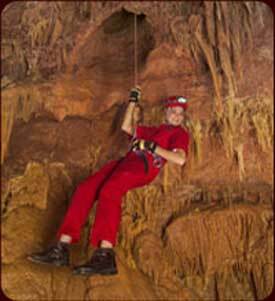 On these tours you suit-up like a true cave explorer with the provided caving gear (harness, helmet, headlamp, rappelling gear, spare batteries, spare light, and water) and you'll get to walk, climb, and crawl on paths that meander through the cave and are covered with loose rocks, mud, and some formations. 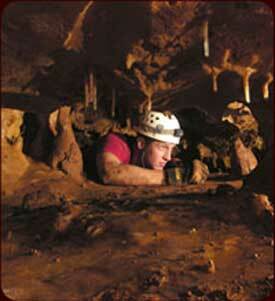 Discovery Adventure Tour - this tour's passage hasn't changed much since the discovery of the cave 45 years ago. It starts at the same place that the regular tour starts and gives you an opportunity to see some immense chambers like Sherwood Forest and Castle of the White Giants before it leads to the "wild cave," where you negotiate various obstacles. As a part of the 3 hour 1.25 mile adventure you'll get to free climb up a 25 foot mud-covered slope, do a belly crawl through a 50 foot tunnel called "Birth Canal," a short traverse over a pit, and enjoy Belayman's Bluff. Hidden Passages Adventure Tour -this fun 3 to 4 hour tour takes you to an additional half mile of cavern that was discovered in 1967 and named Hidden Passages. There are two entrances for this tour - a 160' shaft or a walk-in tunnel. The original cave discoverers used the shaft entrance to get into the cave, which means you'll be lowered on rope by a wench through the 160' long 22" wide shaft down into the cavern! The walk-in entrance will take you through the Jaremy Room and to the bottom of the shaft entrance where the tour begins. Some of what makes this tour unique and interesting is that you'll see delicate hollow formations called soda straws that grow to astonishing lengths, many are 6' to 10' long! In fact, the third longest soda straw at 14' in North America is in Hidden Passages. 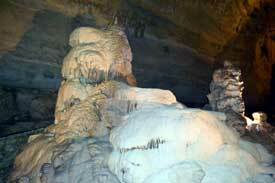 You'll also see limestone crystals that are so pure that light shines through solid rock! Lantern Tour - like the name, you'll explore the cave just like the original discovers did decades ago, by the light of your cave lantern! Discovery Passages illuminated only by the light of your cave lantern. You'll get the feeling that you were the first people to experience this spectacular underground cavern. Make sure that before or after your tour you visit the Natural Bridge Mining Company, home to Texas' largest sluice, which gives you an opportunity to pan for gems and minerals just like some of the "Gold Rush" miners did in their search for gold. But you won't have to dig for gold, you'll just buy a bag of rough (sand, dirt, gems, and minerals) and pour it into a screen bottom box over a trough of flowing water - and then search and hope to find sparkling quartz, sapphire, rubies, topaz, emeralds, or other gems. There are 5 different types of rough mining bags you can buy including on one that has arrowheads or one that has fossils. The Canopy Challenge Adventure Course and Zip lines are the newest attraction at Natural Bridge Caverns. 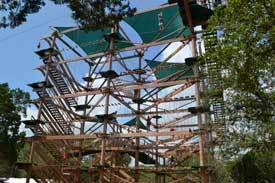 The Canopy Challenge Adventure Course will test your agility, balance, and strength over a series of 47 obstacles which you'll access by climbing up a 60 foot four tier tower. But don't fear, you're hooked into a secure safety harness and a guiding track system that ensures your safety. For the little people under 48", there is a Canopy Kids Course where you can walk beside the kids as they experience the obstacles. A fun adventure that the whole family can enjoy. After the Adventure Course, you should hook up for a zip line ride. 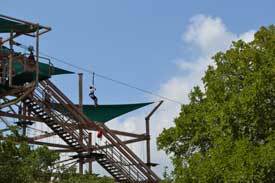 Starting on a tower over 50' above ground, you'll zip over beautiful Texas Hill Country. A scenic as well as thrilling ride. 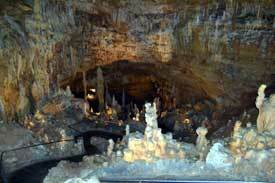 Bottom line, you need to add Natural Bridge Caverns to your list of Must Do Texas Attractions. It is fun, family friendly, unique, and affordable - doesn't get much better that. We can't wait to get back and take one of the adventure tours, the zip line, and the canopy challenge.